Yes, be sure to make it to the end of this post for a fun giveaway :) As always, let me know if y'all have any questions on anything in the post! There are SO many amazing pieces for women. I first off want to mention this terminal luggage. It has been on my wishlist for years (seriously!). Every time I have tried to purchase it, it has been backordered for months! I was SO excited to see that it's not only on sale for 20% off, but also in stock. My Mama and I have a tradition of giving each other luggage ever Christmas. We always do some Barrington pieces (#12 and #13), but this year we decided to do a Barrington bag + the terminal carry-on for each other. I chose the pink (OBSESSED!!) as I have pictured above and the grey snake print Captain's bag for my duffle. My Mama chose the terminal in navy and the Captain's bag in this print (0622). I'm so excited!! Also to mention, favorite busted knee jeans that y'all see me wearing all the time are 40% off. I just purchased these Ugg boots and am obsessed!! They're 35% off and so cute. There's a great buy on these Hunter Boots. And my curling wand that I receive SO many questions on is also ON SALE! I'm about to purchase this star print dress (15-20% off) for a Christmas event we have coming up. And my Madeline bow earrings are also on sale. They come in both post and clip on backing. There are a bunch of amazing items for kids as well. I've rounded up a few I'm loving for Madeline above :) This darling little bow-back tartan dress is one of my very favorite Christmas dresses I've purchased for Madeline. It's even more amazing in person. y'all! AND it's currently on sale for under $30. I also purchased a few pieces for her from Gymboree, like this darling deer skirt, sparkle sweater and pleated bow dress. They're all currently 50% off, and I received an extra 20% off on top of that with the code "WP813TTXDN1PANS". I also purchased these ornament PJs for her and got the matching pair for myself, both 50% off + the extra 20%. Santa brought Madeline this kitchen two years ago, and she still plays with it every single day. It's adorable, especially with the farmhouse sink. I was also so excited to see the Corolla doll on sale. She loves these since they're scented with vanilla and never ever loose their scent. Now that I've shared my picks, I'm going to provide y'all with a list all my favorite retailer running amazing promotions below. These are some of my very favorite stores to shop at! Gymboree - 50-75% off entire store, no code needed. Use code "WP813TTXDN1PANS" for extra 20% off. Now for the last thing on the list! As I promised, a giveaway! :) I am giving away TWO $100 Gift Cards to TWO lucky winners. The winners will be able to select a $100 gift card to their store of choice. Entering is super easy. All you have to do is follow the steps through the Rafflecopter widget below. The giveaway will run through Monday 11/26 11:59PM EST! Good Luck! I enjoy shopping at Nordstrom however if I'm shopping for clothes I feel like I get more for my money at HM, old navy, and I'm drawing a blank. But when I take in to consideration Nordstroms returns are so easy and free I sometimes end up ordering from them. It mostly depends on what I'm shopping for. I love J. Crew, Ann Taylor, Loft, Kohl’s, Nordstrom, Gap, Banana Republic. Love how detailed this post is and that you included more deals at the bottom!! My favorite store is Talbots, but it's seldom in my budget. JCPenney has great sales and I shop there a lot. I love to shop at Nordstrom! Such great deals this year! I'm loving all of your sale picks that you shared! I'm hoping to swipe a new pair of Ugg boots before the really cold season gets to GA! I like to shop at Walmart. So happy I found your blog! My favorite store to shop at is h&m and Walmart! These are awesome deals! My favorite place lately to shop is target! I love shopping on Amazon! Love these ideas! It’s great to have them all in one place! Thanks! I love shopping at Kate Spade and Lilly Pulitzer! I love to at walmart because they have most everything that I`m looking for at low prices. Great list of stores, my favorite is Nordstrom. Hard choice. Thanks for the chance. Kohls is my fave store. My favourite store has to be Nordstrom! I have to go with the boring "Amazon" answer because, as a person without a car, it is convenient that I can get almost anything from them and have it quickly delivered to my door. The main stores I visit in person tend to be thrift shops like Goodwill because they have unique items that can't be browsed or purchased online. Of conventional department stores, my fave is Nordstrom because I like a lot of the products they carry. I love JcPenney, admittedly! It has Sephora and clothes! My favorite store to shop at is Hot Topic. I love to shop at Amazon for variety :) but there are so many world wide shops like holyclothing.com that I love too. My favorite store to shop at is Kohl's. We have one right up the street from us. I love shopping at Homesense. My favorite store to shop at is Amazon..
My favourite store to shop at is Winners . They have great deals . My favourite store is Chapters! I can't really afford to shop anywhere fancy, So Winners is my favorite store because the offer brand name at reduced prices. My favorite store to shop at is nordstrom's. They have some amazing sales and such a great selection. I like shopping at Amazon since they have practically everything. I love shopping at Amazon. Lots of great deals. My favorite store to shop is Target! I love shopping at local shops the most! I love to shop at Old Navy. My favorite store to shop at is Costco. :) Followed closely by Target and Nordstrom Rack. I love to shop at Target. I love to shop at Marshall's. I love shopping at Ardene's with my girls! H & M is a favourite of mine, carries all sizes and so many departments to choose from. My favorite place to shop is Amazon! They have almost everything and shopping online is a lot easier for me! I love shopping Nordstrom. They have everything for everyone on my gift list. Plus, anything I’d like too! I'd have to say that my favorite store to shop at in person is Target. Online is Amazon. I have to admit, I enjoy shopping at Superstore! I like to shop amazon. I love to shop at Kohls and Amazon! As a whole Walmart because they usually have everything I need, but I also love Target, Amazon, Box lunch, Hottopic and more. My favourite store to shop is The Gap. My favorite store is Target! I love getting food and items for my apartment. My favorite store to shop at is Old Navy. I like to shop at local stores whenever possible, but it can be easy to get sucked into a place like Target! Punk Rave is my current favorite brand. My favorite store to shop at is definitely Target. I love to shop at Target! Amazon is my favorite store to shop at because of the huge selection. Amazon makes it easy for me to search what I am looking for. Love the post! That tartan girls' dress is too cute!! I love shopping at Amazon. They have great deals. Kohl's is my favorite store to shop at! I love their clothes! My favourite store is Sephora! I like to hit up all the lightning deals at amazon during the Christmas season. My favorite store to shop at is Target. I love the format of this post! It is so helpful and so easy to shop the links. I have two young nieces and I never know what to buy for them but your list really helped! Thanks for making Christmas Shopping effortless! I shop at is Kohl's! I find so many things I love there. My favorite store to shop is Walmart. Amazon all the way. I love the sales they have like 90% of the time. I have had trouble with sellers on amazon but its nothing that they wont fix. and nothing so big that turns me away from buying from the again. Those slippers - I’m seriously OBSESSED!!! Best buy is my favorite store to shop in. I love Target...they have everything! And Pottery Barn. I live in a tiny mountain town so we don't have many shopping options here, so mostly i shop on amazon! I like to shop at Belk. My Favorite store has to be Gymboree. I love buying cute kids clothing ! I love Kohl's and Target! I like to shop at amazon. Target is my favorite place to shop! My favorite store to shop at is Nordstrom. Amazon is my favorite store to shop at. 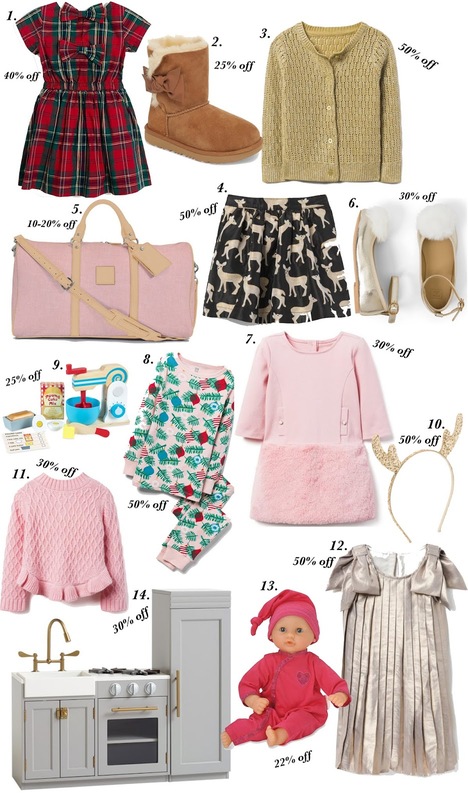 Such an amazing roundup, & I also loved your Cyber Monday post! :D Things have had to be really budget-conscious for me lately, so Old Navy, Target, and Macy’s Backstage are the stores I’ve been shopping at.